Xavier, comte de Chavagnac (crested paper label with illegible collection number inscribed) (the spice box). With Vandermeersch, Paris (the spice-box). 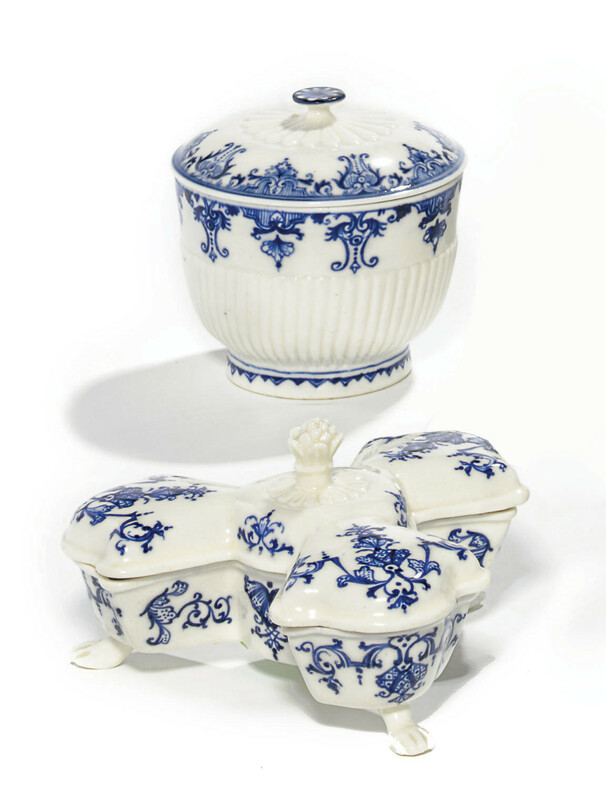 See Aileen Dawson, A Catalogue of French Porcelain in the British Museun, London, 1994, pp. 11-22, cat. no. 8; Christine Lahaussois, Porcelaines de Saint-Cloud, La Collection du Musée des Arts Décoratifs, Paris, 1997, cat. nos. 55, 56, 57; and Bertrand Randot, Ed., Discovering the Secrets of Soft-Paste Porcelain at the Saint-Cloud Factory ca, 1690-1766, New Haven, 1999, cat. nos 68, 69, 70 for examples of the triple-spice box found in the collections of the British Museum and Le musée des Arts décoratifs.